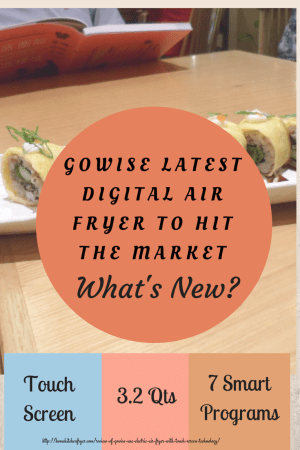 GoWise has just released their latest 4th generation new model home electric air fryer with 3.7 quarts (GW22621) or 5.8 quarts 5.8 quarts (GW22731) cooking capacity. So, what are the improved features of this new model compared to the older 3.2 quarts air fryer? Has the manufacturer addressed the users complaints of its older model? One common complaint of the old manual model was its cheap quality timer control button which broke down after a few uses for some users. With this touch screen interface model, this has eliminated the use of a poor quality timer control button. 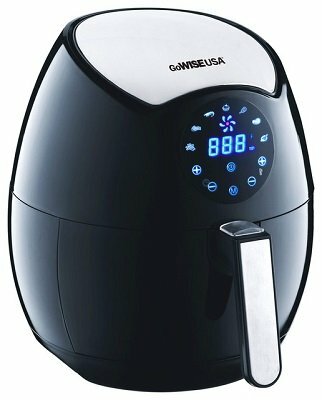 Before this GoWise 3.7 quartz large capacity air fryer with digital controls hits the market, only the earlier model 8-in-1 Electric Air Fryer comes in digital version. Check out GoWise 2.75 qt air fryer review It comes with a few color choices. In the older model, the cooking basket has a non stick pan beneath the basket. The basket does not sit inside a drawer like that of the Philips air fryer. The drawer surrounds the basket on all sides as well as underneath and is thus in a better position to catch the excess oil that drips out during the cooking process whether from underneath the basket or through the slits on the sides. Update : The pan in the 8-in-1 fryer has now been upgraded to a nonstick drawer. Well, with this latest GoWise USA digital large capacity air fryer, the 3.7 quarts cooking basket now sits inside a drawer. Even though the basket and drawer now occupy more space inside your dishwasher, it is a good improved feature. With this 2 main complaints taken care of, let’s check out the features of this GoWise USA GW22621 (black) Electric Air Fryer with touch screen technology. 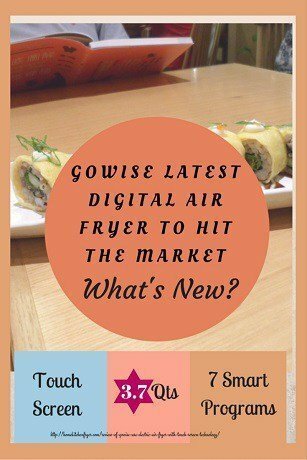 So, let’s get on with the GoWise digital 3.7 Q hot air fryer review. As with all air fryers in the market, the heating coil is located in the top part of the fryer with a fan above the coil. The fan pushes the hot air rapidly all around the air fryer or to be more precise, all around the food cooking in the basket. Hot air hits it from the top, sides and bottom. The moving air is so fast that the heated air reaches the highest temperature of 400 degrees F in just 3 minutes. You do not have to heat up the air fryer like you do for the oven. The GoWise digital large capacity hot air fryer comes with a 3.7 quarts cooking capacity and this can easily cater to a family with 3 – 4 members. You can get it in black (GW22621), red (GW22644) or purple (GW22643). (The GW22831 XL air fryer comes with 5.8 qt capacity). You can fit in about 4 chicken breast meat or 3 – 4 drumsticks into the 8″ x 8″ non-stick Calphalon coated metal cooking basket. For best results for crispy fries, the recommended amount is 17.5oz. It has 7 built-in smart programs namely for Chips, Meat, Chicken, Steak, Shrimp, Fish or a manual program. The older manual model does not have this 7 preset programs that make it easier to choose the correct temperature and cooking time especially for those new to hot air frying. By pressing the plus or minus icons on its LCD touch screen panel, the temperature can also be manually adjusted from between 170°F – 400°F, a slight difference in range compared to the older model’s temperature range of between 176⁰F – 392⁰F. Cooking without adding oil or just a tablespoon of oil is the hallmark of hot air frying. All raw meat or frozen food stuff meant for baking can be cooked without additional oil added. In fact, excess oil drips out onto the drawer below and the end result is fried food that is crispy outside and moist inside without leaving an oily taste in the mouth. Grilling vegetables or frying homemade potato fries would get better results with a tablespoon of oil added. You can fry, bake, grill or roast in your GoWise 3.7 qt digital air fryer. This makes it a very versatile modern kitchen appliance. It is fast. Your fries would be ready in just 15 minutes, your raw chicken wings will be ready in about 12 – 15 minutes, marinated chicken drumsticks take about 25 – 30 minutes, homemade fries take just 15 – 20 minutes. The whole chicken (not more than 4 -5 lbs) or Cornish hen will take about 30 minutes to an hour. Remember to turn it over halfway through the cooking time. You’ll get a golden brown juicy chicken. Make sure internal temperature reaches 165°F. Most important, these are low in fat compared to traditional cooking methods. The package comes with a recipe booklet that has 14 recipes. You can also check out their air fryer cookbook (buy separately) for more recipes. The 30 minutes timer comes with auto standby mode feature. It beeps and automatically switches to standby mode when cooking is completed. You have to unplug the fryer to turn it off completely. This safety feature prevents overcooking and burning of food. This means that you can attend to other chores such as preparing a salad to go with your air fried chicken wings. The timer will also stop when you open the basket to check on your food. It will continue right where it stopped once the basket is pushed back into the fryer body. 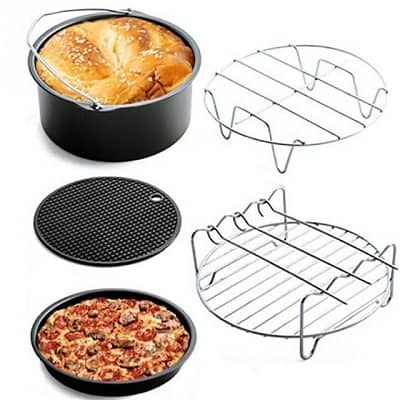 The detachable non-stick cooking basket sits on a drawer and has a button guard to prevent the drawer from accidentally dropping off when you lift the basket (or when your kid tries to pull it out from the drawer). To separate the basket from the drawer below, you push the clear button guard forward, then press down on the black button located on the handle. Remember, the drawer contains the hot excess oil dripped out from the meat you are cooking and it is good to know that GoWise has your safety in mind when they design their latest hot air frying machine. Just like all GoWise airfryers, this digital 3.7 Qt air fryer is ETL Certified meaning that the product complies to North American accepted safety standards. It is safe for your teenage children to cook their own meals using this GoWise hot air cooker. 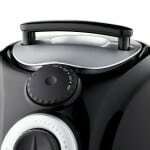 Air fryer accessories open up more cooking options and thus more choices of recipes. For example with skewers, you can cook kebabs. You can create another layer of cooking surface with a rack, thus frying burgers and toasting buns at the same time. With the GoWise baking cake pan, you can bake cakes or cook your favorite curry dish. You can also used it to fry breaded food items, sauteed foodstuff or any soft or liquid recipes. The handle makes it easy to take out your cooked food. A good example of an air fryer with multiple accessories included is the Lidore oil less air fryer with its 6 useful accessories. However, you can still use Pyrex or bakeware that can withstand high heat and which fit nicely into the drawer. The only problem is in finding the correct size accessory. All removable parts ( the detachable iron metal cooking basket that is coated with nonstick Calphalon and the drawer ) are dishwasher safe. If doing manual washing, then soaking the basket and drawer in warm water immediately after cooking makes washing up later a simple process. This product is built according to North American electrical standards. Designed in USA and manufactured in China, this latest 4th generation 3.7 Qt air fryer does make life easier in the kitchen. With LCD touch screen digital control, you get more precise temperature control compared to manual knobs control. You get the 7 preset cooking programs and these are useful if you are just starting out. 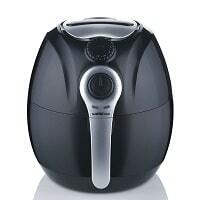 Hot air frying with the air fryer regardless of brands does require a learning curve. A lot depends on the amount of food ingredients you put into the basket, whether a single layer or food piled on top of each other, smaller cuts or big size chunks, raw or frozen. With the preset modes, at least you just press the suitable icon according to their instructions and adjust from there. 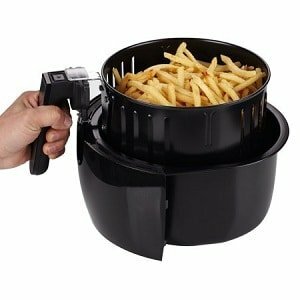 Fast cooking, versatile and easy to clean make this hot air frying machine appealing. Customers feedback and reviews are mostly positive about this product. They love the healthy oil-free food and ease-of-use features. Price wise, it is certainly more appealing compared to the more expensive large capacity Philips digital airfryer. You can get it in black or white. For those who are not into touch screen interface, GoWise does have a manual second generation 3.7Q large capacity electric hot air fryer with 2 buttons for controlling temperature and time. 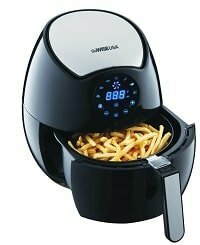 This manual GoWise air fryer is only available in black. It comes with detachable cooking basket and has the convenience of a carry handle. Unlike the digital model, the temperature range is only from 175°F – 392°F. It has a 30 minute timer. The machine goes into standby mode when cooking is completed. However, unlike the digital model GW22621 with the touch screen technology, this manual model GW22622 does not come with any preset cooking programs or menus. The 2 control buttons are placed one on top of the other unlike the inner and outer button position of the first model. The temperature knob is on top with the timer knob below. Well, I would say these knobs are more user friendly compared to those on the older model.